After dark forces conspired to corrupt the fabric of reality, Eddie's immortal soul is shattered and strewn across the cosmos - this issue leaving him in a Powerslave Egyptian world! 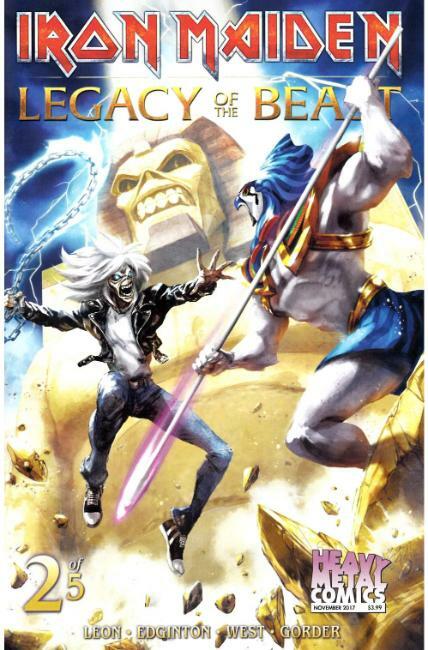 the first official Iron Maiden comic series, based on the band's hit mobile role-playing game - Iron Maiden: Legacy of the Beast - in which players battle as Eddie across the many worlds of Iron Maiden's discography, from the ancient sands of Powerslave to the far future of the Final Frontier . Available in three cover versions.